The fascinating Egyptian Mau is truly a living relic! The feline that once graced the royal courts of the pharaohs and silently stalked mice in palace corridors, truly captures the mystery and elegance for which cats are so loved. With its engaging personality, splendid looks, and above average intelligence, the Egyptian Mau is one of the most exquisite of cat breeds. The Egyptian Mau was developed in the United States in 1953, from cats imported from Cairo, Egypt by exiled Russian princess, Nathalie Troubetskoy. Not surprising is the Egyptian Mau's remarkable resemblance to the cats featured in Ancient Egyptian wall paintings. Most experts agree the Egyptian Mau is indeed the cat domesticated from a spotted subspecies of the African Wild Cat by the Ancient Egyptians. In fact, mau means cat in the Egyptian language. The Egyptian Mau played a key role in the religion, mythology, and everyday life of the Egyptian who held cats in high esteem. They were worshipped as deities, cherished as pets, protected by laws, and mummified and mourned upon their death. Silver maus exhibit pale silver ground color across the head, shoulders, outer legs, back, and tail with the underside fading to a brilliant pale silver. Its coat is medium in length with a lustrous sheen and silky and fine in texture. 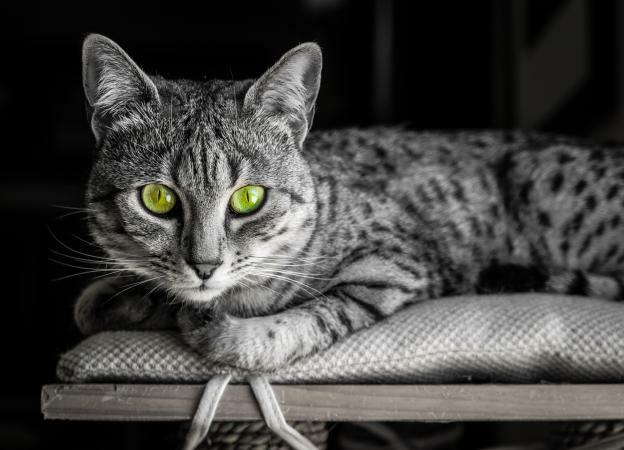 The back of a silver mau's ears are grayish-pink and tipped in black while the nose, lips, and eyes are outlined in black, creating a gorgeous contrast. The upper throat area, chin, and around the nostrils are pale clear silver, appearing almost white. With a brick red rose and black paw pads, the silver mau is simply stunning! Bronze maus exhibit warm bronze ground color across the head, shoulders, outer legs, back, and tail, with the darker bronze on the saddle and lightening to a tawny buff color on the sides. The underside of the bronze mau fades to a creamy ivory. Its coat is medium in length with a lustrous sheen and is dense and resilient in texture. Overall the markings are dark brown-black with a warm brown undercoat, showing good contrast against the lighter ground color. The back of a bronze mau's ears are tawny-pink and tipped in dark brown-black. The nose, lips, and eyes are outlined in dark brown, with dark brown on the bridge of the nose. The upper throat area, chin, and around the nostrils are pale creamy white. 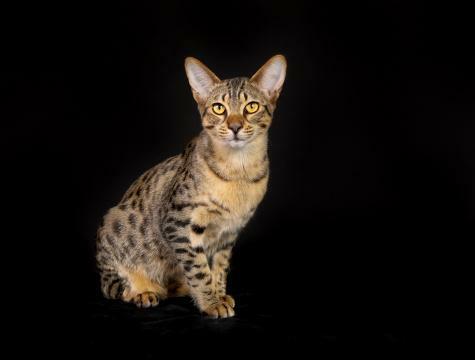 A brick red nose and black or dark brown paw pads distinguish the lovely bronze mau. Smoke maus exhibit pale silver ground color across the head, shoulders, legs, tail, and underside, with all hairs tipped in black. The high contrast markings on the smoke mau are jet black against a white to pale silver undercoat. Its coat is medium in length with a lustrous sheen and is dense and resilient in texture. The nose, lips, and eyes are outlined in jet black. The lightest shade of the coat color is on the upper throat area, chin, and around the nostrils. The smoke mau has black whiskers and black paw pads. This dramatically colored mau is the only one with a black nose. The Mau pattern is common to all colors and features distinct random spots over the torso with variance in size and shape. Ranging from small to large, the spots are seen in round, oblong, or irregular shapes and are a deeper shade than the ground coat. As these elongated spots reach the rear haunches they blend to form a dorsal stripe which continues along the top of the tail to its tip. The tail is heavily banded and has a dark tip. The upper front legs are heavily barred but do not necessarily match one another. The underside is marked with deeply colored vest buttons or buttons which stand out against the lighter coat. On the face, the cheeks are barred with mascara lines. The forehead is barred with a characteristic M and frown marks forming lines between the ears, which continue down the back of the neck with elongated spots along the spine. Interestingly, the British bred Mau have a mark on their foreheads reminiscent of the scarab beetle. This distinctive mark is seen in cat statuettes made at the time of the pharaohs and now on display in the Louvre in Paris, the British Museum in London, and other museums throughout the world.